Using exotic particles called quantum dots as the basis for a photovoltaic cell is not a new idea, but attempts to make such devices have not yet achieved sufficiently high efficiency in converting sunlight to power. A new wrinkle added by a team of researchers at MIT—embedding the quantum dots within a forest of nanowires—promises to provide a significant boost. Photovoltaics (PVs) based on tiny colloidal quantum dots have several potential advantages over other approaches to making solar cells: They can be manufactured in a room-temperature process, saving energy and avoiding complications associated with high-temperature processing of silicon and other PV materials. They can be made from abundant, inexpensive materials that do not require extensive purification, as silicon does. And they can be applied to a variety of inexpensive and even flexible substrate materials, such as lightweight plastics. But there's a tradeoff in designing such devices, because of two contradictory needs for an effective PV: A solar cell's absorbing layer needs to be thin to allow charges to pass readily from the sites where solar energy is absorbed to the wires that carry current away—but it also needs to be thick enough to absorb light efficiently. Improved performance in one of these areas tends to worsen the other, says Joel Jean, a doctoral student in MIT's Department of Electrical Engineering and Computer Science (EECS). "You want a thick film to absorb the light, and you want it thin to get the charges out," he says. "So there's a huge discrepancy." That's where the addition of zinc oxide nanowires can play a useful role, says Jean, who is the lead author of a paper to be published in the journal Advanced Materials. The paper is co-authored by chemistry professor Moungi Bawendi, materials science and engineering professor Silvija Gradečak, EECS professor Vladimir Bulović, and three other graduate students and a postdoc. These nanowires are conductive enough to extract charges easily, but long enough to provide the depth needed for light absorption, Jean says. 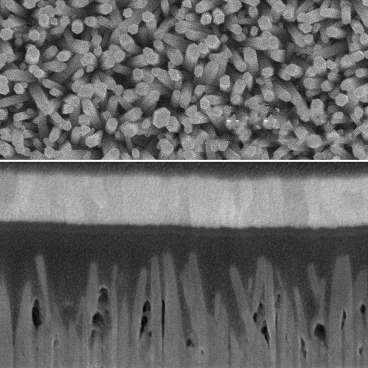 Using a bottom-up growth process to grow these nanowires and infiltrating them with lead-sulfide quantum dots produces a 50 percent boost in the current generated by the solar cell, and a 35 percent increase in overall efficiency, Jean says. The process produces a vertical array of these nanowires, which are transparent to visible light, interspersed with quantum dots. "If you shine light along the length of the nanowires, you get the advantage of depth," he says. But also, "you decouple light absorption and charge carrier extraction, since the electrons can hop sideways onto a nearby nanowire and be collected." One advantage of quantum dot-based PVs is that they can be tuned to absorb light over a much wider range of wavelengths than conventional devices, Jean says. This is an early demonstration of a principle that, through further optimization and improved physical understanding, might lead to practical, inexpensive new kinds of photovoltaic devices, he says. Already, the test devices have produced efficiencies of almost 5 percent, among the highest ever reported for a quantum-dot PV based on zinc oxide, he says. With further development, Jean says, it may be possible to improve the devices' overall efficiency beyond 10 percent, which is widely accepted as the minimum efficiency for a commercially viable solar cell. Further research will, among other things, explore using longer nanowires to make thicker films, and also work on better controlling the spacing of the nanowires to improve the infiltration of quantum dots between them. What you'd then optimaly want is layers that look like a Peano curve (or a Koch curve...or any other type of fractal that fills the volume with a thin, folded layer.) Maybe even just a vertical racetrack configuration. Any of which would be quite a challenge to manufacture quickly/cheaply.